Spread the word. Don’t miss this opportunity to apply! Deadline for Applications is 7 June ! The Young Planning Professionals’ Programme was initiated in 1991 at the 26th ISOCARP World Planning Congress in Guadalajara, Mexico. Since then, senior members of ISOCARP have happily – and at times perhaps a little enviously – observed the competition for admission to the workshop, the creative spirit of the workshop itself, and the enthusiastic response of the participants. It has become tradition to organise the workshops in the week preceding the annual world planning congress in order to provide unique opportunities to Young Planning Professionals (YPPs) to share their experiences in an attempt to resolve complex and multi-dimensional planning problems. Today, the YPP Programme, together with workshops and intensive training programmes, has become a source of meaningful debate, and new ideas and rejuvenation for the Society; and has made a huge impact on participants’ professional lives. It has contributed towards making life-long friendships beyond borders, languages, cultures and professional backgrounds. According to this tradition, The Urban Planning Society of China (UPSC), in cooperation with ISOCARP, agreed to plan the Young Planning Professionals’ National Workshop in Xi’an between the dates, July 23 and 27, 2018. The workshop will be jointly undertaken by the Youth Work Committee of the UPSC and the Xi’an Urban Planning & Design Institute. The purpose of the workshop is to contribute to the knowledge base and improve skills of young professionals, the future leaders of our profession, meanwhile provide international academic exchanges and mutual learning opportunities for both domestic and international youth planners. Each coordinator and participant will spend five full days working with the YPP group between 23 and 27 July. The workshop results will be presented on 27 July 2018, followed by a Certificate Ceremony and Exhibition Opening (venue to be announced soon). There will be a necessity of conducting meetings with local hosts and press in Xi’An. Therefore, all participants should arrive on 22 July in Xi’An at the latest and depart not earlier than 28 July. The call for international WORKSHOP COORDINATORS is open to ISOCARP Members only. It is intended to select five workshop coordinators, including three Chinese coordinators and two International coordinators which should allow the provision of professional expertise and good abilities to work with the group of YPPs. Two international workshop coordinators will be selected from among the applications by ISOCARP. ISOCARP welcomes applications from full members with proven expertise in urban design and planning and with academic experience and/or teaching experience in similar professional training programmes. Colleagues with experience in urban design and planning, sustainable urban development and heritage studies are especially encouraged to apply. International experience is a plus but not a must. Also, the basic understanding and/or interest in the region will be treated as advantage. The most effective composition of the team will be taken into account for the final selection. There will be honorarium of €1000 for each of the international YPP Workshop coordinators for the duration of time they will spend guiding the YPPs and participate actively in the defined tasks, and particularly to encourage coordinators to attend the 54th ISOCARP World Planning Congress, where a presentation on workshop results will again take place. The selected coordinators will also be provided an allowance for the international travel with a maximum of up to €1200 for applications including visa expenses (return, economic fare). UPSC will be in charge of arranging accommodation, full-board and local transportation for the entire duration of the workshop (including transfers to and from the program venue and airport according to their various individual planned flight itineraries), within the agreed dates in Xi’An. – A clear scan of your passport (photo page) and information whether you need a visa to China. 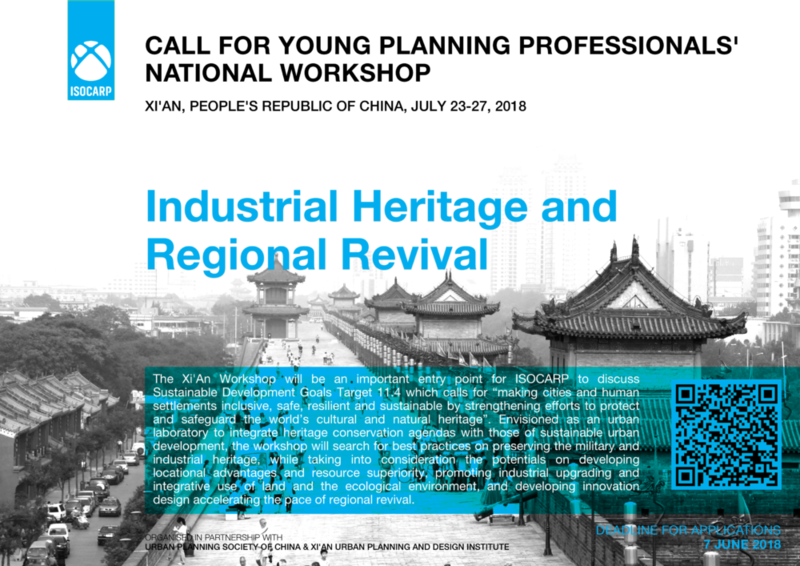 The call for workshop participants is open to INTERNATIONAL YOUNG PLANNING PROFESSIONALS OUTSIDE CHINA – professionals or Master/PhD students in Planning, Urban Design, Architecture, Policy Development, Geography, Social and Political Sciences, or another related discipline. Young professionals with experience in urban design and planning, sustainable urban development and heritage studies are especially encouraged to apply. It is intended that the workshop will gather 20 YPPs, who are not older than 35 years and who offer a keen interest in the workshop theme. The overall team will include 16 Chinese to be selected by Urban Planning Society of China and 4 International YPPs to be selected by ISOCARP. The cost of modest accommodation (shared hotel rooms), full-board and local transportation for the entire duration of the workshop will be covered by the local organizers (UPSC together with Xi’An Urban Planning and Design Institute) within the agreed dates. ISOCARP and UPSC will reward 2 best Chinese and 1 International young professional to participate in the 54th ISOCARP World Planning Congress through a travel allowance up to €500 per person. Applications and CV (Resume) should be sent to Zeynep Gunay, VP YPP, gunay@isocarp.org.